Steel baths are the latest trend; they are designed to suit modern sensibilities with not just the perfect look for the trendy bathroom but also the perfect blend of amazing design and finishes, with high quality, durable stainless steel. These baths allow your water to stay warmer for longer too! Fitting a steel bath will not only give your bathroom a more stylish finish but they are also built to a very high standard which makes them much more durable and robust than other examples. Ideal if you want something that will last for a long time without looking worn out after a year or so. If you have a contemporary bathroom then these steel baths are an ideal option as their designs reflect current trends. 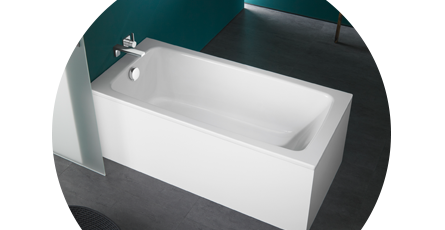 The sleek, simplistic lines are suited to more minimalist spaces and will give your bathroom a wonderful centrepiece. It's a bath. It's the one we ordered. It came on time. The quality of the product was excellant.